Mopar Replacement Igntion Wires 90-03 Dodge, Jeep 5.2L, 5.9L Mopar Replacement Ignition Wires 90-03 Mopar 5.2L, Mopar Replacement Ignition Wires 90-03 Mopar 5.9L, Black 5.9L Mopar Ignition Wires, Black 5.2L Mopar Ignition Wires, Black 5.9L Mopar Ignition Wires, Black 5.2L Mopar Ignition Wires, Mopar Ignition Wires, [Mopar Replacement 4728038 Wires] - $89.95 : 3rd Strike Performance, Your Source for Late Model MOPAR Performance Parts and Accessories! Now you can put a set of wires on your Mopar from the people who put them on it when it went down the assembly line! 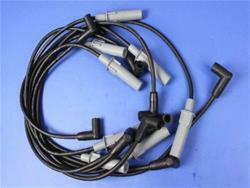 Mopar replacement ignition wire sets are as close to the original ignition wire sets as possible. Just like the OE, each carbon suppression wire is created in the dimensions with the correct spark plug boot. Keep your vehicle looking and performing its best with Mopar's full line of genuine Mopar parts.